Starting 2015 with science. This is a more in depth post about yeast phylogeny. Please have a look at the more basic post here. This time, I would like to discuss the relationship of various Brettanomyces/Dekkera strains and share my results concerning the recent WLP Brettanomyces bruxellensis Trois yeast ID crisis. I would like to start with the Brettanomyces/Dekkera strains first. I obtained 38 Dekkera/Brettanomyces sequences (26S rDNA) from the CBS database, aligned them using MUSCLE (run in default mode, see MSA in Fig 1) and reconstructed a phylogenetic tree using MABL (model HKY85) and rendered using TreeDyn (run in default mode, Fig 2). I would like to emphasize the importance of having a look at the intermediate steps in constructing a phylogenetic tree since sequence alignments can happen in various ways. Looking at the MUSCLE output, one can already expect to see the individual strains clustered together due to their sequence similarities. However, there is one particular sequence that seems to be a bit off (sequence number 1, B. naardenensis CBS 6116). This sequence seems to be different from all the other B. naardenensis sequences shown at the bottom (sequences 29-38). Based on this result, one can expect to see CBS 6116 to be an out-group to the other B. naardenensis sequences. In summary, the alignments seem to be okay and let’s have a look at the phylogenetic tree of the 38 sequences. As already observed in the MSA, the individual Brettanomyces/Dekkera species cluster together as expected (Fig 2). B. naardenensis CBS6116 does indeed form an out-group (isolated from lemon drink in France) and is kind of distant to the other B. naardenesis sequences. So why is this CBS 6116 sequence different? To address this question, I tried to figure out first what other sequences are similar to CBS 6116 by BLASTing against the NCBI nr database (run in default mode). I got several hits and manually inspected the results via alignment. 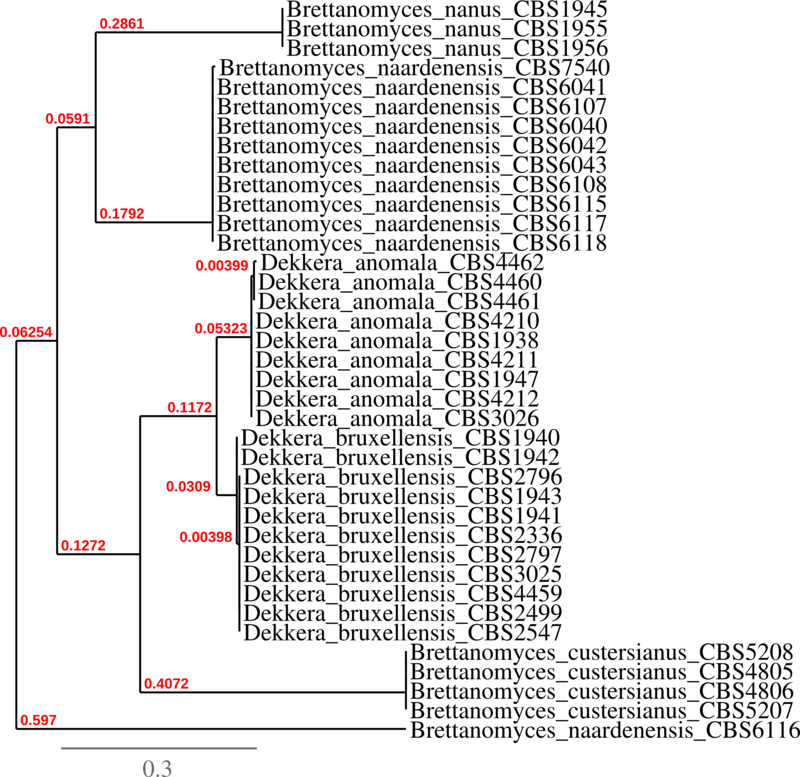 The CBS 6116 sequence has high sequence identities to Pichia guillermondii (Fig 3). One might reason – based on these results – that CBS 6116 is not a Dekkera/Brettanomyces strain. Going back to the phylogenetic tree in Fig 2. It seems that all the current Dekkera/Brettanomyces species end up in the same clusters and show enough substitutions to tell individual species apart. This is very important information for everyone interested in determining the species of an unknown Dekkera/Brettanomyces strain. I got interested in the WLP story (WLP Brettanomyces bruxellensis Trois not being a Brettanoymces strain) and started by looking at the WLP Brett Trois ITS sequences I received from Omega Labs (reads 64-ITS1.ab1 and 64-ITS4.ab1). I had a quick look at the chromatograms and would not use any of the reads for my own work due to its low base quality and multiple peak calls at certain positions. Besides the read from Omega Labs, I received a read used to ID the B. Trois as Saccharoymces cerevisiae at Charles River’s Lab as well as the read published by SuiGeneris. Since I don’t have the chromatograms for these two sequences, I manually inspected the reads in various alignments to get an idea about their quality. Lets start with my analysis for the WLP Brettanoymces bruxellensis Trois ID’ing based on phylogenetic trees. To get the most likely phylogenetic tree one has to follow some basic rules. Beginning with looking at the same shared derived homologous traits (homologous DNA sequences) and verifying that no other DNA sequence alterations impact the phylogenetic tree like sequencing errors (wrong base calls, no base call, multiple base calls etc). So far so good. I aligned some ITS2 regions from various CBS Saccharomyces strains to the various ITS2 reads from WLP’s Brettanomyces Trois (Fig 4). Lets have a look at the alignment shown in Fig 4. Especially at the 64-ITS4.ab1 read from WLP B. Trois (sequence 1 shown at the top). One can easily see, that various base differences exists compared to the other sequences in the alignment. Supporting the initial idea that the DNA sequence from this read is not very reliable nor very representative (if one compares the read to the two other WLP B. Trois reads shown at the bottom). Due to the differences in this read, I would not be surprised to see this read out-grouped in the phylogeny tree later on. The two reads from Charles River’s Lab and SuiGeneris seem to be way better and similar to other Saccharomyces sp. sequences shown in the alignment. To make the phylogeny more computational efficient and more reliable, I extracted the sequences mapping to the two WLP sequences (sequence regions from the right side in Fig 4) to receive the alignment shown in the next figure (Fig 5). A first look at the alignment in Fig 5 reveals some hotspots for variations like gaps and different base calls (color regions). The question I would like to address now is whether the variations are due to speciation or artifacts. Artifacts are commonly more random than variations due to speciation. A quick inspection reveals lots of random variations in the 64-ITS4 read but none/few for the two other WLP B. Trois reads. As expected the n64-ITS4 read gets out-grouped and might be interpreted as a different species. 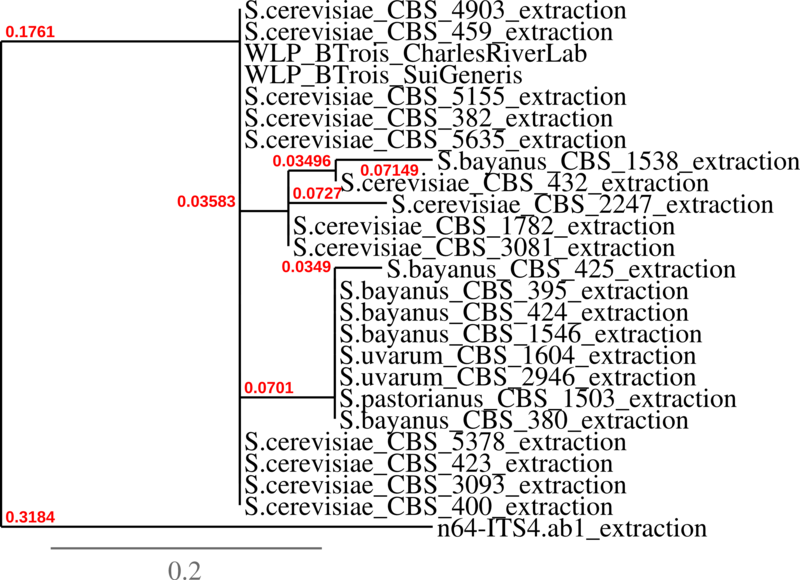 Well this is true if one just looks at the tree in Fig 6 but did not look at the previous alignments and possible reasons for the out-grouping. In this case, the quality of the base calls for the n64-ITS4.ab1 read are very poor and led to wrong base calls after all (investigated by pair-pair alignments). In summary, the differences leading to an out-grouping of WLP B. Trois based on the n64-ITS2 read are not due to the physical differences in the DNA sequence but due to sequencing errors. In summary, the two WLP B. Trois sequences group together with other Saccharomyces cerevisiae strains. Supporting the current view that WLP B. Trois might indeed not be a Dekkera/Brettanomyces strain (at least based on ITS2 sequence homology). Or at least the samples of WLP B. Trois that float around these days. As I do isolate and work with my own Brettanomyces strains, it happened to me various times that I was able to observe some Saccharomyces cerevisiae beside the initial Brettanomyces strain after some serial re-pitches (and I did not use Saccharomyces for the fermentation). This Saccharomyces contamination might lead to problems during the propagation. Saccharomyces cerevisiae might overgrow Brettanomyces increasing the Saccharomyces:Brettanomyces ratio even further. Eventually leading to very few Brettanomyces cells left in a population. Keeping Brettanomyces samples is not as easy as one might think. And I would not be surprised if more yeast conundrums turn up in the next years. This entry was posted in Projects and tagged Brettanomyces, Yeast by eurekabrewing. Bookmark the permalink. So based on this information, could you draw any conclusions about what effects this would have on the behavior of WLP644? Would it act more as a Sacc. or Brett. yeast, for example? Having used it once myself, I remember thinking how similarly it performed to a standard ale ferment, but also reveling in the interesting flavors it threw off, unlike other Sacc. yeasts. I guess you would really need to get more into a detailed SNP analysis? I would not dare to make any conclusions from these results. One has to remember that only one region of the genome was sequenced (26S rDNA) for the genotyping. Although I would not expect to see a classification as Brettanoymces in case one looks at different sequences. I would like to see more data and wait for the WLP sequencing project. I think that the original (banked) WLP Trois is a Brettanomyces strain but might have been altered due to propagations (as mentioned in the post) or anything else and Sacc got more prominent. Resulting in a standard ale fermentation. And maybe some Brett character down the line when the Bretts get to work. For yeast flavors, think of the variety of ale yeasts (wheat, Belgian, Saison etc). They are within the same family but have different profiles. Meaning there is a lot of variation within the same family. In summary, I think that WLP Brett Trois is a Brettanomyces strain but what got on the market lately as WLP Brett Trois, was not Brettanomyces. That’s what all the most recent analysis showed. I would disagree – the samples I sequenced were from two isolates, one new and one dating from white labs first release. Both sequenced as sacc, and both give the expected flavour profile when used in a beer. Moreover, I plated 10^8 total yeasts of both isolates on cycloheximide, and three weeks later the plates remain clean (meaning it is unlikely, in the extreme, that there is any brett in either sample). I’m dubious that a minor brett “contamination” (that would account for less than 1:10^8 cells) would create either the pellicle-like ferment nor rapid production of fruit character that we see in these strains. Great work as always! I’d like to see other sequences and alignments of WLP644 to figure out exactly what is going on with this yeast. I’m also curious to see whether BSI Drie is different. I can do plating, RAPD-PCR, RFLP and possibly some sequencing. I should hopefully have some on the way from that share on Milk the Funk, so maybe we could collaborate to do some comparative analysis of WLP644 and BSI Drie. Jup. Looking forward to get more seq information about this strain. 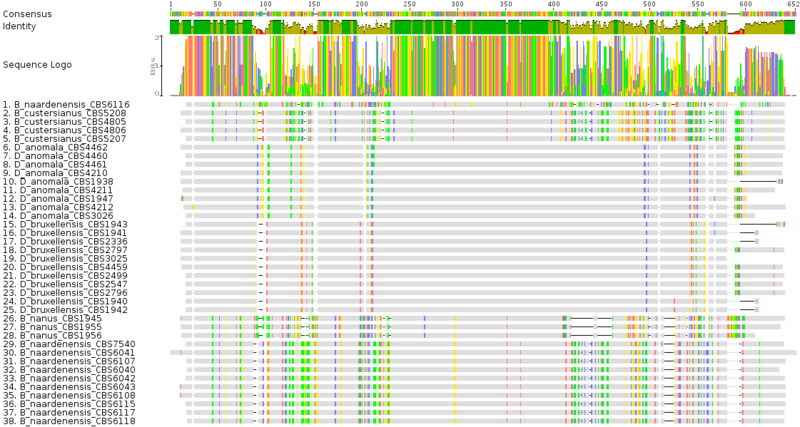 rDNA is not the most interesting regions to look at. I thought BSI Drie is a different strain than the WLP Trois one, isn’t it? I would not mind having a look at the bioinformatics in case a comparative study comes into existence. Cannot do the sequencing myself though (although I have access to a MySeq which I cannot use for private projects). If I am not mistaken, WLP was aware that B Trois was initially a Brettanomyces strain. Either by testing themselves (in this case, I would be interested to know how they did that) or got the strain from someone else and believed it was Brett. Lets hope the Illumina seq project gives us more insight (if they sequenced the right sample). Thanks for sharing your results. Your cycloheximide tests are indeed good evidence that no Brett is involved. I mean, I just thing that WLP did a proper job to ID their strains when they got the strain. Hence my believes that it was Brett at some point. Concerning the the fruit character. I would not be surprised if that’s something a Sacc could do. Variety of flavors is already there with Sacc strains. Why shouldn’t there be some strains with fruity esters? (or any other molecules leading to the fruity sensation?). Which leads the pellicle formation thing. I am not aware of any Sacc capable of doing that. A look at the FLO genes might be very interesting…. Great site. Just want to add a little useful information here that doesn’t necessarily require TOO MUCH microbiology. WLP BRETT TROIS is ABSOLUTELY NOT a brettanomyces strain. Here’s my simple way of testing it. Brettanomyces strains are, by definition, non spore forming. WLP 644 (Brett trois) forms viable spores. It’s an amazing cerevisiae strain, and the tropical flavors it can impart are fantastic. it’s definitely more drying than a lot of other cerevisiae strains, but not as drying as actual bretts. Cheers on this cool website! I’d agree with this statement… There’s still a lot of cleaning up to do in fungal taxonomy and the anamorph/teleomorph nomenclature of Brett/Dekkera is frustrating. The ability to form spores shouldn’t be used as a differential technique for Brett vs. Sacc in my mind when there are simple and more accurate tools like RAPD-PCR, RFLP, and sequencing. The spores I get are DEFINITELY viable. I suppose i should have (more correctly) said that spore formation is a good confirmation that you’re not dealing with a true Brett. It seems the PCR data also suggests that were not dealing with Dekkera either. I need to mate the spores with another strain to check if they are cerevisiae all the way. > I suppose i should have (more correctly) said that spore formation is a good confirmation that you’re not dealing with a true Brett. Correct. This is why I mentioned that the spores from Dekkera are not viable. Pointing to a non-Dekkera/Brettanoymces identification.